YES, you CAN paint a pile rug! Here is my slightly boring family room. I'll be the first one to say I don't like color. I like clean lines, natural light, and neutrals. I do have a constant fear planted in my head by my good friend Ashli, though. I'm constantly afraid of looking too "old lady", so I decided to shake things up. I needed some pattern in this room. 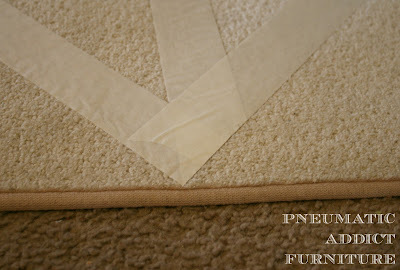 Plus, the old, dirty, hand-me-down rug was starting to curl from my constant vacuum cleaner abuse. A couple of the edges had been pre-chewed by my brother's puppy when he owned it, and our coffee table never lined up with the border (which drove the perfectionist inside me nuts!). 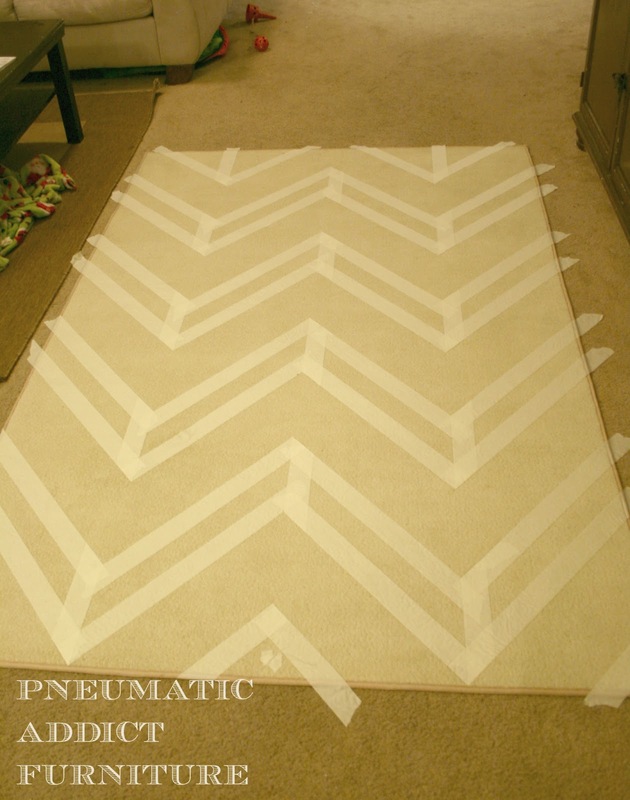 A DIY chevron rug is nothing new. I first saw the idea at Tatertots and Jello. 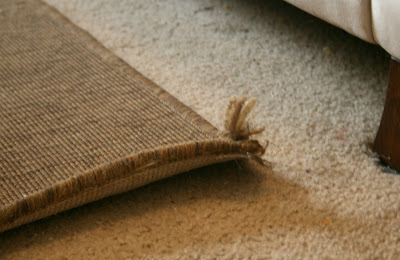 Although, I've spent the last week searching online and I couldn't find this technique used on a pile-type carpet, always on a woven rug. I wanted something a little more formal, and cheap, so I headed over to my local Wally World and found this. 4 1/2 ft by 5 ft + short pile + right color = $20 = PERFECT! $20 is the right price for an experiment. I almost forgot to get a photo of the first step, so ignore the diagonal lines up top. 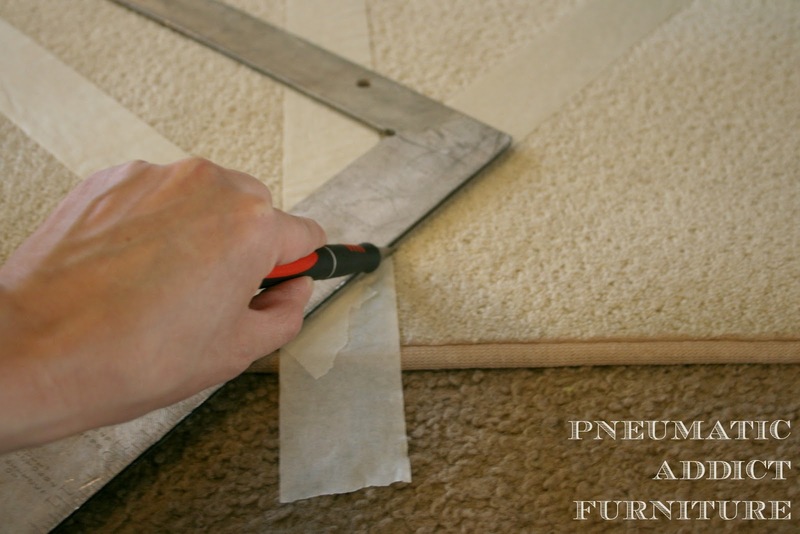 I started by diving my rug vertically into 4 equal sections. How many sections determines how often the pattern will repeat across. Next, I decided how steep I wanted my zig-zags. I measured that distance from the edge of the rug, marked it, and placed the tape diagonally between the next section and the mark. 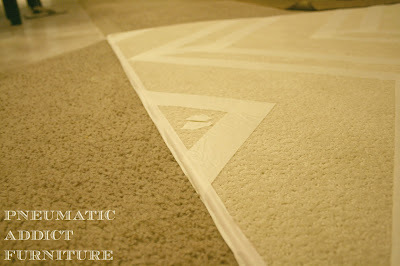 Then, using a square and an Exacto knife, I trimmed off the excess tape, creating clean points. 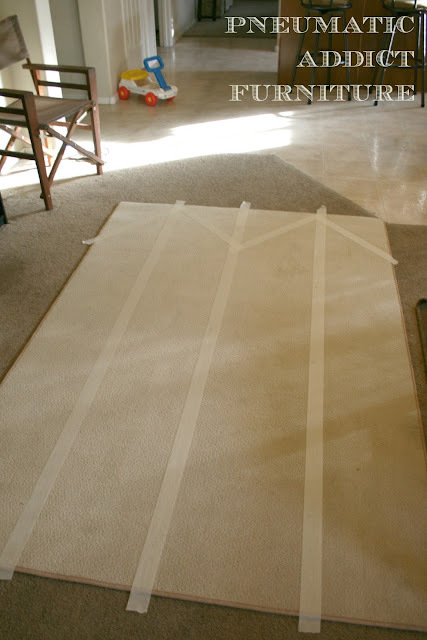 I then just measured how tall I wanted my stripes to be, marked on the tape, and connected one point to the next.This is how it looked after all my excess tape was trimmed off. I chose to make my colored stripes 6" wide and my neutral stripes 4" wide. I walked all over my tape to make sure it was REALLY stuck well to all the little fibers. 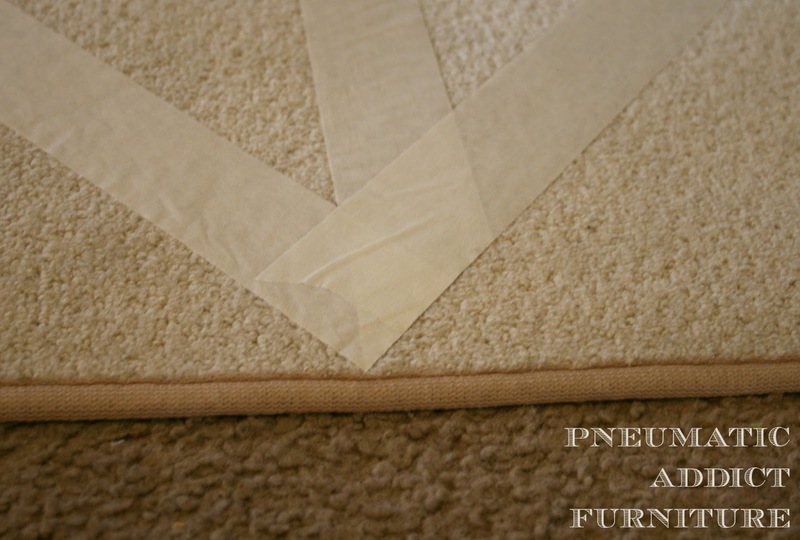 I also covered the binding edge of the rug. I did this for two reasons. 1. I thought a clean edge would look more "store-bought" and 2. It protected my floor from stray paint. 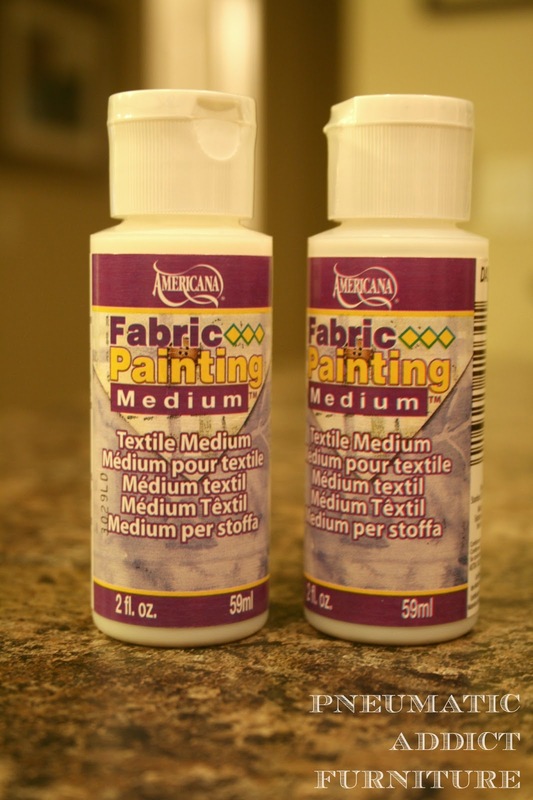 In a separate container I mixed flat, latex paint with textile medium. The medium is supposed to keep the paint from getting stiff. The bottle says mix 2 parts paint: 1 part medium. I bought all 3 bottles they had at the store, but I really could have used more. I ended up using about half a quart of paint and my ratio was more like 4:1. With your paint- textile medium mixture, use a stiff bristle brush and pounce your brains out. I didn't get a photo of this step because I thought it was pretty self explanatory Color inside the lines. This step took me a good while, maybe a couple hrs. And my arm felt like it was going to fall off. I didn't try a foam brush, but I don't think it would have been great in this situation. You REALLY have to work the fibers to get the paint down in the pile and I would be concerned with the foam brush causing paint to ooze under the tape line. I used a semi-dry brush whenever I was close to the tape. 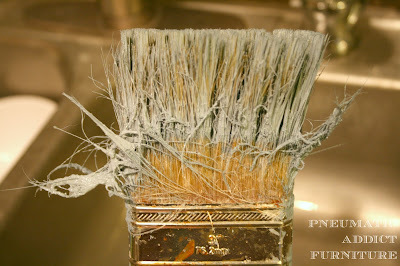 *WARNING- this will RUIN your brush. Just use a cheapy. I bet a couple chip brushes would do the job. Just make sure to really work the paint 'up and down' and 'back and forth'. Pull off the tape as soon as you finish. I used masking tape instead of painters tape and it worked great! No bleeding at all! After letting the paint dry 24 hrs it was pretty crunchy. I think even if I used the proper amount of textile medium it would have been better, but still crunchy. I read the suggestion to use an electric sander on it. Worked like a champ! I used 100 grit and made sure not to press too hard and take off all my hard work. It's still not as soft as the other sections, but not bad. If I were to do it again, I would probably do 5 sections instead of 4. I didn't realize until the tape was off that I had just created a huge "W". Oh well, I don't think anyone would see that but me, plus, it's under a coffee table. I SO glad I didn't paint the binding! I think most people would never know this rug had been painted. I LOVE the chevron pattern! It brought just the amount of young-ness the room needed. I'm not sure about the color yet. It looks okay in the day light, but at night it looks almost baby-blue. I wanted to get close to the wall color without matching it exactly. I was going for more of a "steel" and less "country". I don't know. It coordinates really well with the rest of the room.What do you think? Maybe I'm just being a color baby? Wow! That looks great!!! You did a fantastic job! Oh and I just adore chevron stripes!! how very non old lady ish! yay! great job! Wow- you did a great job- I love the color. This turned out great! 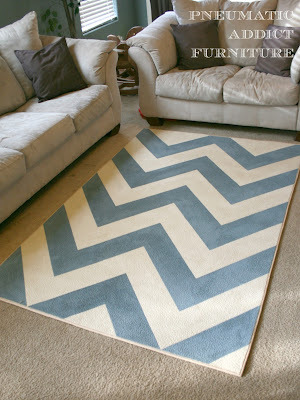 You are right, no one would know that you designed the chevron rug! This is so great! You did such a great job. It did "youngify" the room! Wow, that looks awesome and way cheaper than buying one. Love chevron and the color looks great. Your great rug is like a "youth serum" for the room ... definitely kicked out any "old lady" that might have been hovering around the edges. On my monitor the rug looks to be a very good match for the wall color. I do know the exact same paint used on both walls and ceiling, the ceiling color appears lighter. Maybe that's what happening on the floor too, when you look down, it reads a different color than when we look at the pic? Don't know, just wondering. Could be the night time lighting too ... perhaps change the type of bulb and see what happens to the color at night. Rug looks great. I need to do this!! I can't justify spending 300$ on a rug when I can just do this instead. What a beautiful result! I love the color, and I didn't notice the W until you mentioned it :) Great work! Super cute! I don't know if I would have the patience for this, though. :) I'm bookmarking it in case I get the itch to try it sometime! Um yeah, I am doing this!! I think stripes for me family room. Easier to tape off ;) thanks for being so flippin' awesome!!! Hi! Found you via the Catch a Glimpse Thursday link party! This is great! Pinning for future reference! Thanks for sharing! Your rug is beautiful! I want to try this, but I am very intimidated! Oh my goodness...this is sooooo super "cool"!!! beautiful! 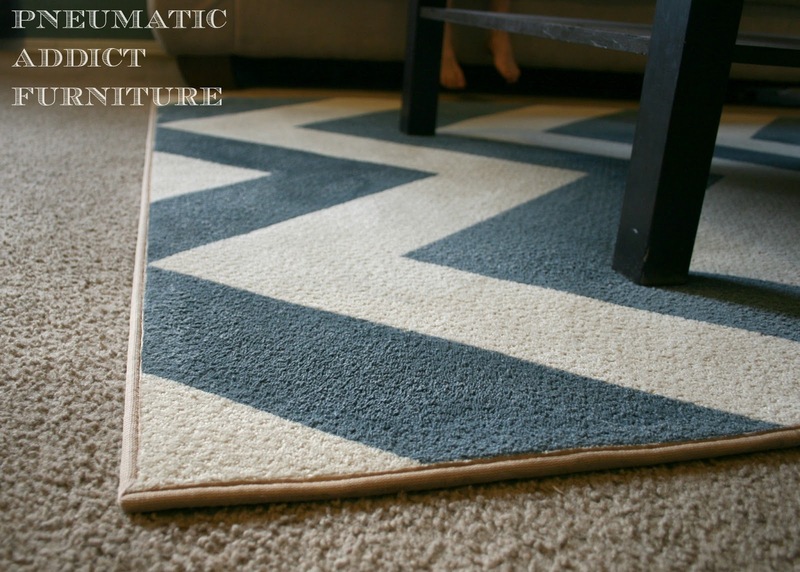 Ive been trying to find a cheap rug solution, and this is perfect!! Id love for you to come and share this at our party! I've had painting a rug on my to-do list for too long. LOVE how yours turned out. 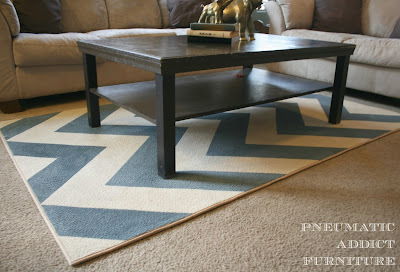 I'm featuring your rug in the PoPP Spotlight this week. Thanks for linking up. That turned out amazing! You did such a great job. I will be featuring this at my Swing into Spring party that opens at 8pm EST. Please stop by and pick up an I've Been Featured button. Thanks. Love it! Great job! Just wanted to let you know our blog was a Wow me Wednesday co-host last week and we are featuring your project tomorrow! Please stop by if you have a chance! I am so impressed with your mad skills. 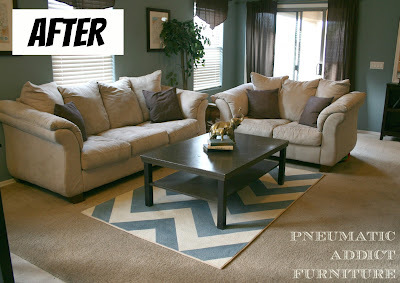 I love the way the rug looks in your family room. So cute and trendy. keep it! Love. The. Rug. It really turned out awesome. I need a new rug for my living room and this price fits the budget!! I found you at Shabby Creek Cottage and am a new follower. I'd love it if you would share this at "What We Accomplished Wednesday," at Green Willow Pond. It is live right now. Have a great week! It looks great, and I don't think the color is too blue at all. It looks like a nice gray-blue and it complements the wall color very nicely. Thanks for sharing! Especially the tip on using the sander. I have yet to find the perfect ratio of paint to textile medium so that's a nice solution. I think it's a great blue---what color are the walls? You did a spectacular job! And the color is great! Not baby blue at all. This is so great! Thanks so much! As soon as the kiddos are back in school me and my besties will be getting our project on! So excited!!! 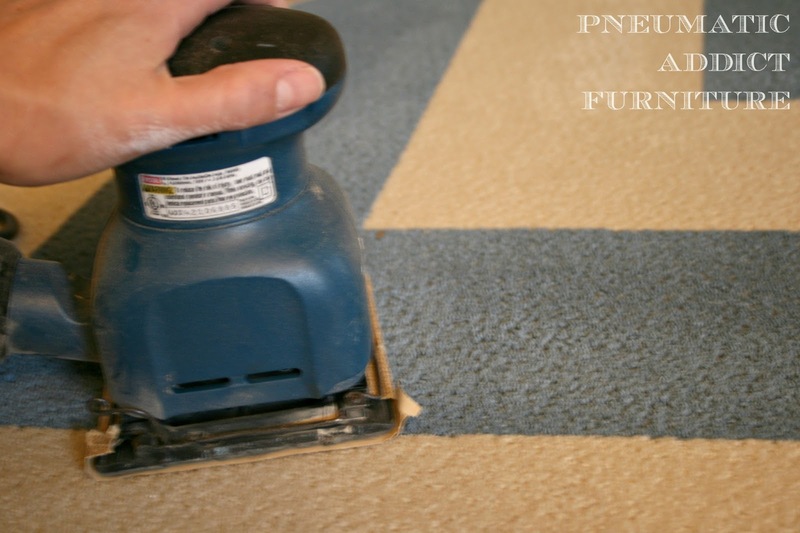 Have you had any problems with the paint transferring from the rug onto your carpet? Thanks for the interest in my post! To answer your question, no, I have not had any problems with the paint transfering. The paint never even soaked through the backing on the bottom, so there is nothing to transfer. The paint has actually held up pretty well after use also. Make sure to sign up for my email feed so you won't miss any of my upcomming tutorials! thank you and good bless!!! Thank you so much! You are very sweet! If you sign up to follow me by email, you can recieve updates of my new tutorials. Thanks for stopping by! This is a sensational technique! I didn't realize there were so many different ways to revamp wool rugs. I'm currently on my own DIY project journey. I'm revamping my bedroom, and thanks to you I have more wonderful ideas to consider in the process! 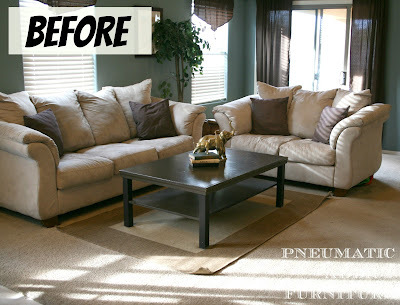 You did a great job and it really added a pop of color to your room. Thanks for joining us at Throwback Thursday! It absolutely makes the room! What an amazing job. You did a great job explaining exactly what you did and I think anyone could follow along and do the same. Thanks for linking up to Throwback Thursday! Kim Oh! and new follower! Love it Elisha! Great tutorial! Elisha, wanted to stop by again and let you know that I chose you as my feature for Throwback Thursday this week. Come on by after 8 on Wednesday to collect your feature badge and link up again! Turned out great, feel free to share at my Sweet Haute Share thursday link party going on now! Party on! As a lover of colour, I gotta say you nailed it, Elisha! The blue in the carpet ties in with your walls beautifully. And gee, you listened to your sister much better than my sister does -- I barely got her to paint their fireplace a 'reddish-brown' rather than brown & that was only because I convinced her hubby first. Good read. It seems to be more special since you designed the rug personally however you wanted. Thanks for posting. Lovely rug... I never know rugs can be painted before, I think the textile paint and laid out stripes did do the trick. Appreciate your hard work, but a successful project implemented! !